The 410' S.S. Badger carries up to 620 passengers and 180 cars, tour buses, RVs, and semi-trucks. The four-hour, 60-mile cruise between Manitowoc, Wisconsin and Ludington, Michigan has all the comforts of home and more. Blending history with cruise ship amenities, the S.S. Badger is the fun and relaxing shortcut across Lake Michigan--a spring, summer and fall treat for the entire family. Passengers will find spacious outside decks for walking or lounging, free movies and satellite TV, live entertainment, two restaurants, full cocktail service, shopping, and staterooms for relaxing or sleeping during the cruise. Activities for kids include a video arcade, coloring contests, and kids' playroom. 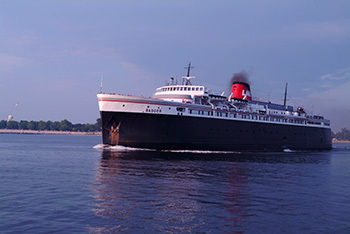 During the fall, passengers can sleep on the Badger in a stateroom while the ship is at the dock in Ludington, Michigan. A trip on the S.S. Badger carferry is a fun and very affordable mini-vacation for your entire family. No matter which way you are crossing the lake, there are restaurants and shops within walking distance of the dock. There are many lodging facilities in Ludington and Manitowoc to accommodate travelers passing through either port. US-10 is an east–west United States highway formed in 1926. US-10 was one of the original long-haul highways which stretched from Detroit, Michigan, to Seattle, Washington, but then lost much of its length when new Interstate Highways were built in its right-of-way. Today, the eastern terminus of US-10 is in Bay City, Michigan, at its interchange with Interstate 75 (I-75) and the western terminus of US-10 is in West Fargo, North Dakota, at its interchange with I-94. 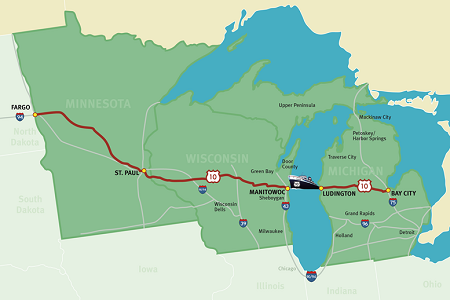 The American Association of State Highway and Transportation Officials (AASHTO) has designated the route traveled by the S.S. Badger across Lake Michigan as the official continuance route of US-10. Prior to this designation, Lake Michigan had separated US-10 in the port cities of Ludington, Michigan and Manitowoc, Wisconsin into two segments. Highway US-10 connects the states of Michigan, Wisconsin, Minnesota, and South Dakota by means of ferrying 60 miles across Lake Michigan. US-10 is one of only two United States highways utilizing a ferry service connection. The S.S. Badger plays a major role in providing connectivity of US-10 for travelers and commercial cargo in the upper Mid-West. *Leaves at 5pm on June 2 and September 1. **No 8:45pm crossing on July 4, July 25, August 15, and September 1. ***No 1:30am crossings on July 5, July 26, August 16, September 2. The S.S. Badger carferry travels across Lake Michigan between Manitowoc, Wisconsin and Ludington, Michigan once daily during the spring and fall seasons. Once summer is underway, the Badger makes two round-trip crossings daily. During the overnight crossing, passengers can enjoy sleeping in a stateroom aboard the ship. Staterooms are available by reservation during each sailing. The number of staterooms is limited, so reserve early. If you don't have the need to cross Lake Michigan, but still want to experience a cruise aboard the S.S. Badger, start small and take a Shoreline Cruise! Many fun excursions are planned throughout the sailing season, each one lasting two hours. It's time to join in the festivities and celebrate this grand ship.